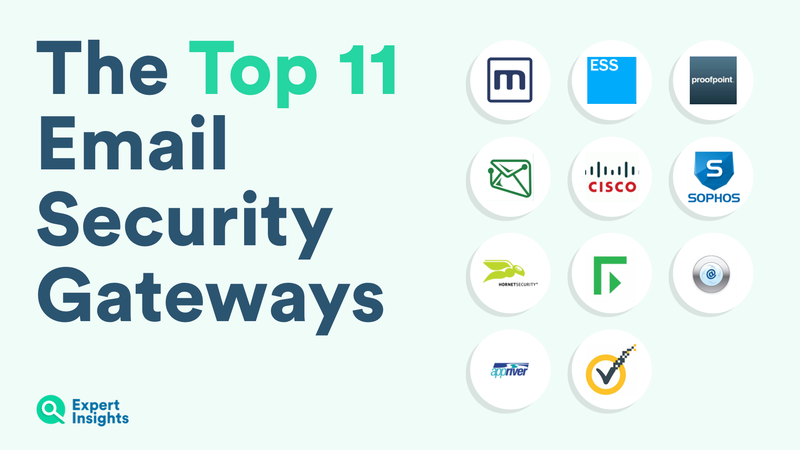 Discover the top 11 best Email Security Gateway platforms. Examine their features such as phishing protection, reporting and admin controls. Email security should be a top priority for your company. Email is the number one target used by hackers to get access to your company’s private data, using attacks like phishing. Your first line of defence should be an Email Secure Gateway. This is a platform which guards your emails against hackers, spam and viruses. There’s many Email Security Gateway solutions available. Some are targeted towards enteprise users looking for granular admin controls and advanced functionality. Some are better suited for smaller businesses looking for an easy to use platform with a good price point. To help you find the right solution, Expert Insights has identied a list of some of the top Secure Email Gateway platforms. We’ll take you through their features; how easy they are to use and how well they work. Want to read independent reviews of all the top Secure Email Gateway platforms? Click Here. One of the most fully featured Email Secure Gateways on the market is Mimecast. As a result, Mimecast enjoys huge amounts of support with mid-size and enterprise organizations. The great thing about this platform is that it’s extremely powerful and customisable. This means your company gets great protection against threats and can fine-tune the service to suit your specific needs. Mimecast offers excellent Impersonation Protection to help prevent phishing attacks. Mimecast also offers features like Attachment and URL protection. These work in real time, stopping threats from infecting your network. Mimecast has a large security division. They monitor billions of emails and have a large threat database. This is important because it means that they are always up to date on the latest threats and are ready to protect your organization against them. The reports and analytics offered by Mimecast are also great. They are easy to understand, allowing you to monitor how secure your emails are and how well Mimecast is performing. Mimecast boasts a low rate of legitimate emails being falsely marked as spam and a high rate of spam and virus blocking. Mimecast is a great option for an organization looking for the most powerful protection for their emails. You can read our full review of the Mimecast Secure Email Gateway here. Barracuda is an ideal solution for a small to mid-sized organization. It gives you a feature-rich email security system, without breaking the bank. Barracuda offers virus scanning and spam protection in real time. It’s easy to deploy with Office 365, making it a perfect option if you’re a small company looking to move your email network over to the cloud. Despite it’s cheap price Barracuda has packed lots of features into this platform. It offers advanced protection with URL scanning and outbound email filtering. These are paid additional features for many competitor services. With these features, it’s no surprise that the service is very popular with smaller businesses & MSP’s. Users are particularly impressed with Barracudas support, which is quick to respond and very knowledgeable. Being a global security vendor, Barracuda has a large threat intelligence division, constantly looking for new threats and developing measures to protect against them. Barracuda Essential offers a host of other services bundled with its email security. This includes an archiving solution, as well as encryption and backup. This is a great range of products and makes it easy to recommend this service to a smaller company or MSP looking for an all in one solution. You can check out the full Expert Insights review of Barracuda Essentials here. FuseMail offers businesses a powerful Email Security Gateway. Highlights of this service are its high level of threat protection and ability to block spam. The platform monitors all inbound and outbound email in real time to protect your network. They also offer great protection against phishing attacks and data loss. FuseMail has focussed on customisability for small and medium businesses with the SecureSMART product. For organizations that can take advantage of the admin controls, this is one of the most powerful secure gateways available. FuseMail also offers admins useful controls over how end users can manage their individual inboxes. Fusemail offers detailed reporting and email logs which highlight how well the gateway is performing and how employees are communicating via emaigenerated as can be scheduled and generated as needed. The platform integrates well with Office 365 and is easy to set up across all devices, even when moving data from an old network. FuseMail is popular among customers, who highly praise their support team. FuseMail offer service level agreements, which guarantee that they will block 99.9% of spam. This is a great indicator that the service works well and that the vendor is on the side of the customer. Cisco has created a great email secure gateway which offers strong defence against business email compromise and phishing attacks. Their research team looking at email threats is huge, ensuring you will always have access to cutting-edge threat protection. Cisco’s platform offers good protection against business email compromise and ransomware. This is due to a feature which automatically blocks links it deems to be unsafe, which protects you from emails even when they look genuine. This platform has a lot of great admin features such as this, which are customizable. The reporting and logging on offer are strong, bring you insights into your email security. Cisco offers great spam filtering, which will ensure you only get the emails you want in your inbox. The platform also features data loss protection, with methods which ensure your emails are protected with encryption. One of the key benefits of this platform is that as a Cisco product, it’s easily integrated into their range of other security services. This means that your organization gets access to strong multi-layered protection. We’d highly recommend this service to larger organizations who can take advantage of this. To find out more about Cisco Cloud Email Security read Expert Insights’ full review. Proofpoint Essentials offers multiple email subscription products aimed at small to midsized businesses, with an Email Secure Gateway at its core. It also offers encryption and archiving, making it a great platform if you’re looking for a complete email package. It offers powerful threat protection, informed by Proofpoint’s extensive security research department. Spam filtering is also strong, with flexible admin controls. Proofpoint has put effort into streamlining this serving, making it easy to use. This is a major benefit for small companies. Customers love the service for how intuitive it is, without compromising on the security effectiveness. It’s easy to deploy and works seamlessly with Office 365 for a smooth user experience. Proofpoint offers good reporting and logging, as well as data loss prevention for your email communications. This service is price effective, offering great value for all the features it offers. Features like Email Continuity are including in the core bundle, whereas they are paid add-ons with other vendors. This value makes Proofpoint Essentials a popular choice for MSPs and resellers. Proofpoint also have a separate cloud platform called Proofpoint Enterprise which is focused at larger organizations than Essentials. Expert Insights understands that Enterprise and Essentials will eventually be merged into one platform and this review will be updated once the merger has been completed. You can read our full review of Proofpoint Essentials here. Hornetsecurity Secure Email Gateway is an advanced service offering strong spam filtering effectiveness. Hornet’s threat protection is powerful and admins have a good number of features such as whitelisting and backlisting controls. Hornet has a focus on ease of use for end users, prioritizing fast email processing. This means that there is minimal latency when you send or receive an email, which is perfect for people relying on email every day. Reporting is another great feature of this service. It offers spam reports and visibility over email traffic, with tools to monitor real-time traffic. This can help admins to easily troubleshoot any issues or snags with incoming emails. The service offers good URL and malware controls, as well as phishing and DDOS protection. This ensures your organization is safe against a range of threats. Hornetsecurity is an ideal solution for small to midsized companies. It’s cost effective with a good range of features, with a focus on making end users email communications easy. Hornetsecurity is based in Germany, making them an option for organizations seeking a supplier not connected to the United States. Hornetsecurity is distributed in the UK and US by EveryCloud Technologies. You can read our full review of Hornetsecurity here. Sophos Email Security offers email security powered by cutting edge technology. Their product has a focus on threat protection. It offers inbound and outbound message scanning and time of click URL protection, which is a vital feature for protecting your business. Customers like this service for how customizable and scalable it is. This means it’s easy to grow alongside a business and can adapt to new threats. Sophos also offers a good level of spam protection, with anti-spam filters. It offers a number of end-user features which let them monitor their own inboxes. This is great to keep things running smoothly and reduce the burden on IT departments. Reporting and logging are comprehensive, with even reports, message history and gateway activity. For a complex and fully featured service, the deployment of Sophos is flexible and easier than many competitors. The service integrates well with G-Suite and O365. It’s also well priced, offering good value. It also has a ‘follow the sun’ support team, which means you can get help 24/7 from one of their global teams. We’d recommend this option to mid-sized businesses, and this is another service which is popular with managed service providers and resellers. You can read Expert Insights’ full review of Sophos here. The Email Laundry offers a good all-round Email Secure Gateway. The highlights of this service are threat protection, spam filtering, and admin features. The Email Laundry has a number of good threat protection features. They offer impersonation detection, which is great at blocking phishing attacks. You can also filter emails based on IP, so if you have trouble with one particular spam source it can be blocked. It also offers attachment and URL scanning. Admins can create custom policies to make sure that the service is protecting the business efficiently, which they can view with reports and overviews. End Users can also manage their own inboxes, with flexible controls to see where emails they have been sent have been marked as spam. The Email Laundry is popular with customers. They praise its ease of use and great customer support. This service is ideal for mid-sized companies. Expert Insights particularly recommends the Email Laundry to businesses who are having trouble with phishing attacks. This is because unlike other services, the Email Laundry includes Impersonation Detection with its core email gateway. You can read Expert Insight’s full review of the Email Laundry here. Forcepoint Email Security offers businesses strong threat protection. This service has a range of features to protect your business against phishing attacks. It offers real time threat detection, powered by machine learning. Forcepoint also includes sandboxing and malware protection with data loss prevention. The levels of threat detection on offer is the biggest benefit of this service. Forcepoint also offers effective spam protection. The platform offers a service level agreement promising organization that 99% of spam coming into your network will be blocked. Reports show your email security stats for the last 30 days, which helps admins to monitor and enforce email policies. Forcepoint also offers some security training to help end users spot threats. Forcepoint is a popular choice with companies. They like the strong threat protection on offer, and praise how easy the service is to administer after installation. There is also a range of add-on features which can make Forcepoint a good option for multi-layered email protection. This service is a great option for companies looking to set a ‘set and forget’ service, which they can run in the background and not have to worry about fine-tuning. You can read Expert Insight’s full review of Forcepoint Email Security here. AppRiver offers a good all round email security service. This service is popular with users, with many praising how easy the service is to administer. It’s also easy to implement, with no hardware or software needed. AppRiver offers strong threat protection. The service runs on five anti-virus engines which use machine learning algorithms to block malware and phishing attempts. AppRiver also offers good spam filtering, which clients highly rate. The service offers daily spam reports, with good drill down options so you can have visibility over different domains. AppRiver also offers great features for admins, allowing them to whitelist and blacklist, as well as set permissions for end users. AppRiver offers great customer support. It’s not the fastest, or easiest to use Email Gateway, but it does offer good protection at a very cost-effective price. You can read our full review of AppRiver here. Symantec is a market leader in email security, with strong threat protection. This service offers a layered approach to email security. It features threat isolation and real-time threat protection. It also features spam filtering which promises to block 99.9999% of spam from entering your network. Symantec also offers detailed reporting, offering logs on the types of threats that face your business. This service includes email encryption as standard. It also provides sandboxing of email attachments, meaning that your networks stay safe from all types of threat. Clients argue that this service is easy to use, as it streamlines the admin and ends user controls. As a global security vendor, Symantec runs a huge threat intelligence network. Their size may mean they are slow to add new features compared to smaller more innovative competitors. But the threat protection they offer is advanced and will keep your company safe. You can read Expert Insights’ full review of Symantec here. Each Secure Email Gateway brings unique features and benefits. All offer a high level of threat protection, with controls to prevent spam and phishing attacks. Finding the one that best suits the needs of your business is crucial for you to improve your security.